It's double soberness for me at the moment. Firstly because of the event of yesterday which saw a helicopter belonging to Leicester City owner crash down in flames outside the King Power Stadium after their 1-1 draw with Westham United and also as a result of our unfortunate draw in today’s match against Crystal Palace. Details of casualties and those on board still sketchy. My thoughts are with everyone at Leicester. Arsenal’s run of winning was put to an end following a 2-2 draw at Selhurst Park on Sunday afternoon. The first few minutes of the game experienced less threat from both sides as they tried to get into the game Alexandre Lacazette missed a chance to open the day's scoring record for Arsenal when he gave a strike from an Alex Iwobi pass which went to the side of the post. It was one taken with his weak foot; hence, it lacked spark and direction. It was not so long after that a deflection from a member of the opposition denied Hector Bellerin a chance to change the scoreline. Penalty call for Crystal Palace few minutes to halftime was waved off by the referee because from his view and that of every neutral one, no foul was committed even though there was a partial contact. Shkodran Mustafi will go on to make the wishes of the hosts come to pass. His tackle just less than a minute to the close of the first period conceded a penalty that gave to Palace their first home goal for the season while also putting Arsenal in a first half deficit for the first time in the Premier League this season. Arsenal returned to begin the following half and played with more zeal. That paid off shortly after. 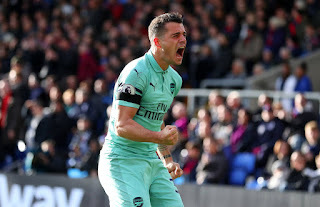 Granit Xhaka grabbed an equaliser for the Gunners in the 51st minute. It was a superb curl into the top corner from a freekick. He did that against Newcastle United, he did it again today. The second half had always been the better one for Arsenal this season. Pierre-Emerick Aubameyang's 56th minute clever sneak from the side gifted Arsenal a first time lead in the game. The Gabonese showed up at a very vital time when there was a scuffle in the box and directed home a ball that was on its way out of play. We allowed them put pressure on us after we took the lead. One could see fatigue written all over our players. That was no surprise. Playing three games in 7 days isn’t an easy task. Our party was ruined in the 81st minute via another penalty from Milivojevic. This time, it looked more like a dive from Zaha and not the fault of Xhaka after all. Xhaka’s stoppage time freekick went too high and that was the end for us. We drew, we lost two points but we will return stronger. We are still unbeaten in twelve games in all competitions and in eight Premier League games.